Visit the Linksys Support Site. Enter “WAP610N” in the search field and press [Enter]. When the WAP610N page opens, click the Downloads tab and choose the version of your device from the Select Hardware Version drop-down menu. Click the Download link under the Firmware category and wait until prompted to save the file. Click Save on the prompt that appears. Choose a location for the file and click Save. When the download is complete, click Close. For Macintosh® users, click Download in the dialog box that appears. Once the download is complete, click the Red button to close the window. QUICK TIP: Save the file on the Desktop or any drive that will be easy to access once you will start the upgrade process. Open the access point's web-based setup page. To know how to access the WAP160N web-based setup page, click here. If you are using a Mac® computer, click here for instructions. 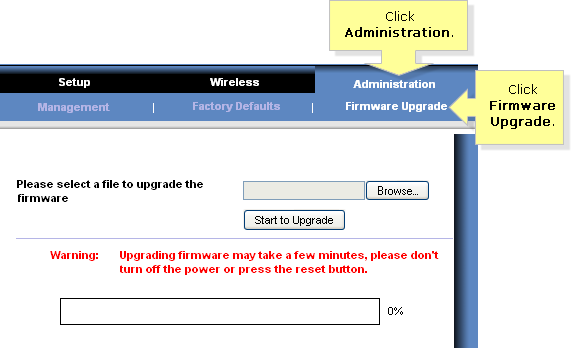 Click the Administration tab and select the Firmware Upgrade sub-tab. On the Firmware Upgrade tab, click the Browse… button to find the file that you have downloaded. Click the Start to Upgrade button and follow the on-screen instructions. IMPORTANT: Do NOT turn OFF the power of your computer or access point or press the Reset button during the upgrade. If you encounter errors or the upgrade has failed, you can try performing the steps again. If you still encounter the same issue, you can try the Management Mode to successfully upgrade your device. To learn how, click here.